The Digital Juice Chroma Pop is our first foray into bringing you non-software products that continue our goal of helping you get your video projects done better, faster, and cheaper. The Chroma Pop is a highly portable, blue|green reversible pop-up screen that is designed to give you perfect keys no matter where you are. It's spring steel frame lets this 7ft by 5ft screen instantly collapse into a bag 1/3rd its size that can easily fit into any back seat, closet, or trunk. When you need it, it instantly pops open to reveal its full size. The blue and green fabric have been specially formulated to give you the best key possible when used with standard editing and plug-in keying software. 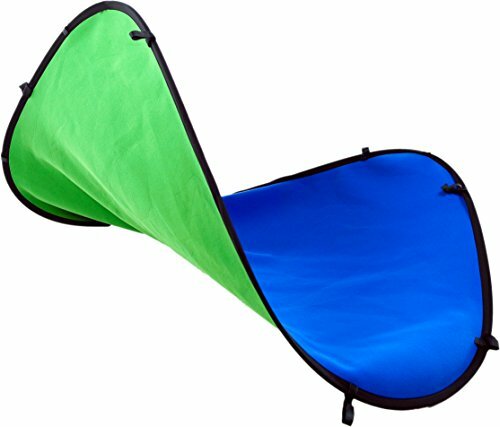 So now, whether you are at home, in the studio or on the road, you can have a high-quality, portable, reversible green or blue screen instantly available to you. High-grade green and blue colored polyester, fused together with 32 density foam. Collapsible metal frame is made from hardened, tempered spring steel.